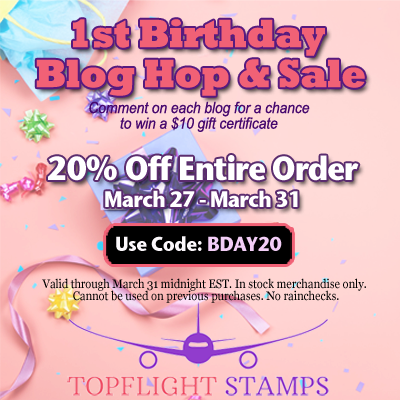 Donna's Crafty Place: Topflight Stamps 1st Birthday Blog Hop!!! Love what you created with these stamps! LOVE your idea! The colors are so vibrant. Great creative INSPIRATION. Thanks! My husband is a woodworker so we have LOTS of wood scraps around... wonderful idea! Love the stamps and your creative ideas are fabulous. Great use of stamps. Love colors. Adorable set of blocks! Love the pretty flowers and bright colors! Very fun project! I love these big time! I'm a flower girl! I love the beautiful color blended blocks too! Those stamps look like a lot of fun!! Happy 1st Birthday! How exciting to see all the beautiful different products you have available. Love the colors and the stamps. 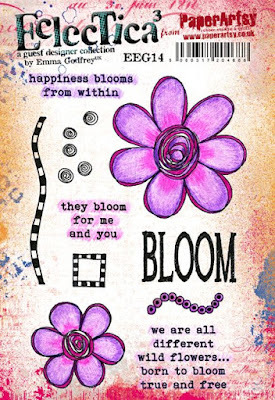 Love how you colored and cut out the flowers to add pizzaz to your blocks. Never heard of chalk acrylics, so that is my new learned thing today! I always love seeing unique ideas and yours do not disappoint! Great job! Great idea to use the stamps to create these Wonderful Works of Art! They are beautiful! Such cute gifts for someone..the colors and designs are colorful and fun. Super cute. Love the bright colors. Very cute! I love how you did the backgrounds! Fun projects! What an awesome variety of stamps Topflight Stamps has! Great, whimsical upcycling project! Well done! I love your flower blocks. Great job! Those flower blocks turned out adorable! Love those springy colors. I love your awesome ideas! ! Great Idea, I have a bunch of wood blocks that I took the stamps off. Now I need some PaperAtrsy stamps! I love PaperArtsy. Their stuff is so much fun. Great idea with the blocks. 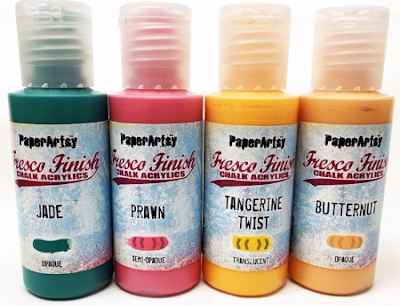 love the Fresco paints - perfect colors for those whimsical images! 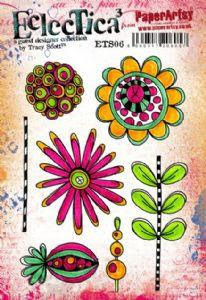 What a cool project!Cute flower stamps, I had never heard of Freso Paints, they look fun! oh, how pretty! i love learning new ways to use my supplies and i'll definitely be adding this to my list. they're perfect for a desk or a bookshelf...hmmmm....i have ideas running through my head now.....thanks! Loved what you did with those wood blocks -- the blocks came out so beautiful.. I just love the Paperartsy line of stamps! I never thought of stamping on a wood block. What a great idea! Such a fun project! I love seeing ideas for using my stamps and other supplies for things that are decorative and outside the box. Happy 1st Birthday, Topflight! May you have MANY MANY more wonderful yrs ahead for all of us to enjoy!! How beautiful, Donna! I love the designs you created, and how you used reclaimed wood. Very inspiring! Lovely projects! Love the pretty color palette!!!! Pretty! Great for the kiddies to play with! How cute are these flower blocks. Love the colors. I like the bold flowers! Great idea for the scrap pieces of wood! They turned out fantastic!! Perfect images for this project! The stamps are so adorable! Don't you just love Paper Artsy stamps? thanks as always for sharing. Beautiful! All the Design Team samples have been amazing! Thanks for the inspiration and for the chance to win such great prize! Thanks for participating in this Hop - I love your art, and I love someone with Autism. Happy Day! !